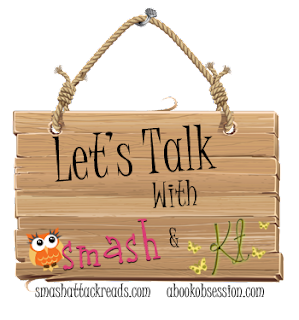 Let’s Talk is a meme hosted by Smash Attack Reads and A Book Obsession. Let's Talk is a a great place to get personal and learn more about one another! Each week, a different question will be posted along with a place to link up your posts and visit other people’s responses. This meme is definitely meant to bring out conversation and meet new people. So, Let’s Talk! Today's Question: How much time do you think you spend on blogging each week, including commenting on other blogs, participating in events, Twitter/Facebook blog talk, etc? Do you have a time management system that works well for you? We’d love to know! Answer: I actually spend a few hours per day on blogging each week, but I don't know how efficient I am, lol. I try to comment on people's blogs as much as I can, but of course, I still feel as if I don't comment as much as I'd like or as much as all the bloggers out there deserve. On weekends I don't do as much because I try to take a break and try to do housework! I do spend a lot of time on Twitter and actually, that's where I'll find links to reviews, articles and bookish events. Then of course, I get sucked into other information which takes away from blogging. I don't spend a lot of time on my FB blog page, except to post my latest reviews. I absolutely do NOT have a time management system. I'm awful at time management. Unfortunately because of my busy schedule in October, Super Storm Sandy, and then getting sick, I feel more behind than I ever have in blogging. I'm hoping to do better soon and thinking of implementing a schedule. We'll see how that works! Some days though I fail. But that's ok because I know everyone is busy with real life. It's really interesting to see what everyone does and they're process. I do spend an hour or 2 trying to comment on blogs a few times a week, usually different ones as I like to discover new blogs. But like you I don't do much on the internet on the weekends. I know how you feel. I've been sick & I just let a whole week go without a post even though I had 10 books to review. I just had to let it idle. I'm awful about being sucked into other information! I'll google one thing and an hour later I still won't have my answer because I've been looking at other things! Real Life is always going to throw curve balls. It's ok. We aren't going anywhere! Oh hell ya. I can relate to this. Twitter convo, click, read, see something else, open in new tab, and I am on a roll towards getting nothing done. The only thing that I am consistently good at is commenting. Great discussion topic. New follower, looking forward to your posts. I spend a few hours a day blogging, socialize on twitter and facebook etc..but its my favorite hobby and like you I don't make it around to as many as I would like. I comment back to anyone who comments on my blog and then I comment on 10-25 random blogs through twitter and facebook..honestly if you have a facebook page for your blog and I follow I comment a lot more, twitter too. My schedule is crazy enough as it is so I'm likely if I spend an hour per week on my blog and a total of two hours per week on my entire website. I do my level best to keep everything fresh and working well so every visitor gets the best possible experience.